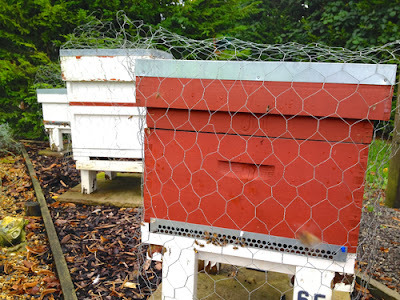 > Time To Protect Your Hives!- 5 tips keeping them safe. There are so many things that bees need to fight off, just to stay alive. You can help these little ones by providing some added protection in October. Heres a brief check list. Woodpeckers love beehives. They see the insects flying out and will peck the thin areas of the wooden hive ( mainly the grooved out finger grips) until they produce a good sized hole. They feast on the bees as they emerge one at a time. They will ruin your hive and kill your bees. I have had sites that for years never had any woodpecker interest- then out of the blue all the hives over night have holes. So we need to protect the hives in the Autumn until May time, after that there are plenty of other woodland insects in abundance to interest our woodpeckers and hopefully not our hives. We cover them with smallish chicken wire mesh. It’s easy to remove if we need to inspect a hive. It keeps the woodpeckers a safe distance off our hives. They can be used for many years. Even if you have never seen a mouse- they are out there and will find your hive! A mouse excluder is a strip on metal with holes big enough for a bee to come and go, but ‘excludes’ a mouse. If these are not put on in autumn a mouse will climb into your beehive, via the entrance, and nest there eating one bee at a time until none remain. Gale winds can blow a roof off and your bees will get drenched with fallen rain. We did tie the roofs down but found some roofs warped in the winter weather. So we use a heavy paving slab on the top and the weight keeps the roof shape in order as well as providing additional rain guard and wind weight. As hedges die back, hives are exposed. This can present problems. If you have animals near by, they can wander up, knock hives and disturb and stress your bees, who will in turn dwindle and die. Another problem is vandals and robbing of hives. In this current time of a shortage of bees, thief of hives have risen by 25%. It is important- ‘Out Of Sight, Out of Mind’. Screening by natural means or artificial, provide wind protection, but allows an open air flow without condensation build up. Condensation within your hive is a bad thing! Bees die as a result of wet, dank, cold conditions. You can help them by providing ample air flow for them to expel any water vapor build up. A match stick placed across the four corners of the brood box, below the overboard provides a tiny gap, too small for wasps and other bees to enter, but large enough for a good flow through of air.